Corporations and governmental agencies of all sizes are embracing a new generation of enterprise-scale business intelligence (BI) and data warehousing (DW), and very often appoint a single senior-level individual to serve as the Enterprise BI/DW Program Manager. 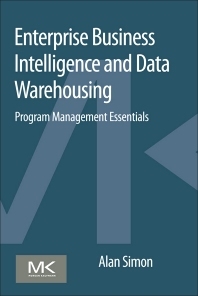 This book is the essential guide to the incremental and iterative build-out of a successful enterprise-scale BI/DW program comprised of multiple underlying projects, and what the Enterprise Program Manager must successfully accomplish to orchestrate the many moving parts in the quest for true enterprise-scale business intelligence and data warehousing. Author Alan Simon has served as an enterprise business intelligence and data warehousing program management advisor to many of his clients, and spent an entire year with a single client as the adjunct consulting director for a $10 million enterprise data warehousing (EDW) initiative. He brings a wealth of knowledge about best practices, risk management, organizational culture alignment, and other Critical Success Factors (CSFs) to the discipline of enterprise-scale business intelligence and data warehousing. Why conduct a quarterly program review? Alan Simon is a Senior Lecturer in the Information Systems Department at Arizona State University's WP Carey School of Business. He is also the Managing Principal of Thinking Helmet, Inc., a boutique consultancy specializing in enterprise business intelligence and data management architecture. Alan has authored or co-authored 29 technology and business books dating back to 1985. He has previously led national or global BI and data warehousing practices at several consultancies, and has provided enterprise data management architecture and roadmap services to more than 40 clients dating back to the early 1990s. From 1987-1992 Alan was a software developer and product manager with Digital Equipment Corporation's Database Systems Group, and earlier he was a United States Air Force Computer Systems Officer stationed at Cheyenne Mountain, Colorado. Alan received his Bachelor's Degree from Arizona State University and his Master's Degree from the University of Arizona, and is a native of Pittsburgh.